Nose: A myriad of fruit flavors, including lime, orange, peaches, and green banana, complimented by chamomile, aniseed, honey, and blossoms. Palate: The fruit explosion continues, with hints of passion fruit, grapefruit, and mango. Some herbs come to the fore, as does some spicy ginger notes. Medium to long finish, ending with light, oak tones. 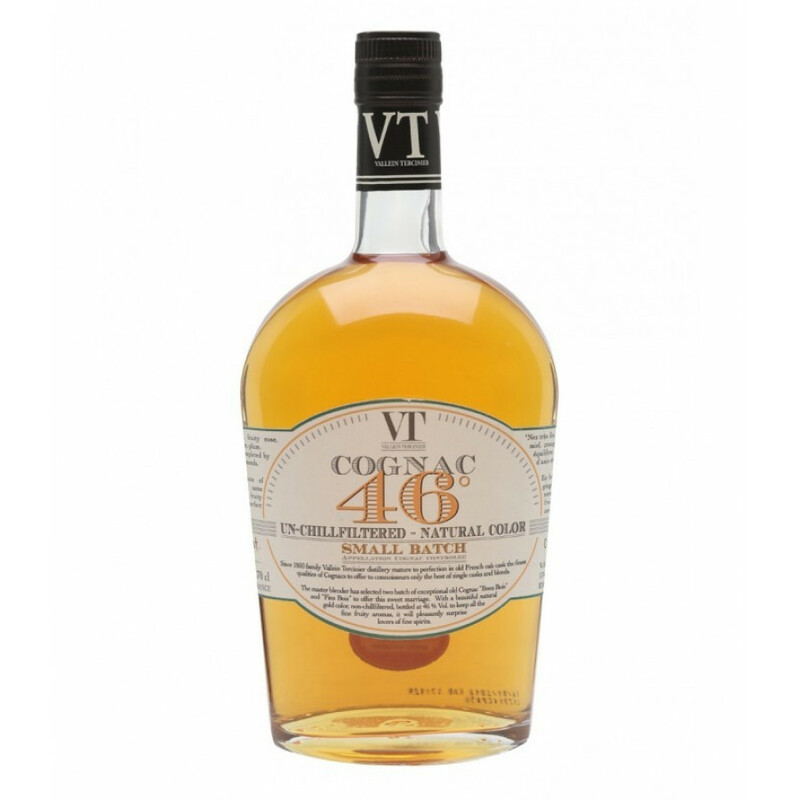 The Vallein Tercinier Small Batch VT 46 is not only a Cognac to sit back and savor, but its one with an unusual taste profile and back story too. Firstly, it's a combination of only two eaux-de-vie. The first is from the new 'buzz' terroir – Fins Bois. With it's veins of high quality chalk and soils that impart a unique floral influence, this is a growth area that continues to grow in popularity. This portion of the blend has been 25 years in the making, languishing in oak barrels until just the right moment to be bottled. The second delight is from the lesser used, Bons Bois terroir. Aged for 15 years, it brings its own qualities to the blend, and together these two wines have created a truly delicious Cognac. VT 46 is a real pure masterpiece. Boasting no additives, and non-chill flitered, this is Cognac created in a completely traditional manner. The end result is a flavor that could almost be described as 'tropical', yet with a slight edge and a little on the oaky side. Presented in a contemporary bottle, it offers extraordinary value for money for a Cognac of this quality. A great choice for your own collection, or the perfect gift for anyone who enjoys good Cognac.